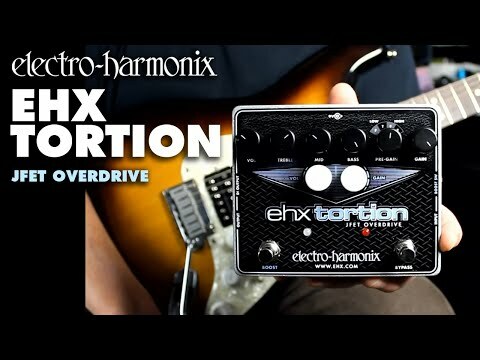 Electro Harmonix EHX Tortion JFET Overdrive and Preamp Hailed by company founder and president, Mike Matthews, as “our flagship overdrive/.. Hailed by company founder and president, Mike Matthews, as “our flagship overdrive/distortion,” the new Electro Harmonix EHX TORTION covers tremendous tonal real estate and provides the player with maximum versatility. Described as “a database of great tone,” the EHX TORTION’s full complement of features and controls make dialing in the right guitar sound intuitive - whatever the era - from vintage to modern. With the Tortion you get two different modes of operation: Normal and Boost. In the Normal mode, the pedal uses three JFET stages to grant you low to medium gain sounds, with the mode's Volume and Gain sitting on the top row of controls. With Boost mode you get a fourth gain-stage, for those high-gain tone, with it's Volume and Gain modes being on the bottom row. Each channel's Volume and Gain controls are completely independent, meaning that both modes function like two channels on an amplifier. Still not convinced? Head down to your local PMT and see if they have this excellent Overdrive pedal in stock and arrange an in-store demo, you won't regret it. If you order this pedal today before 3pm you will be eligible for our fast, free and reliable next-day delivery service (UK customers only, subject to stock levels).